Thank god! A short album! Swole Ear has been killing me lately, with all of these long, unanalyzable records. 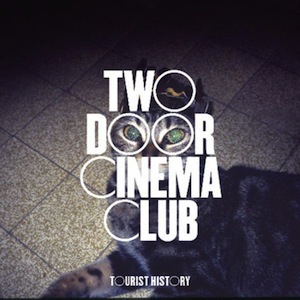 When the awesome last.fm’er pthcfrkabortion suggested Two Door Cinema Club’s Tourist History, and told me of its [relatively short] length, I bumped it straight to the top of the Swole Ear queue. I needed something familiar; I needed to go back to my indie rock comfort zone, if only for a day. And go back to my comfort zone I did. Tourist History returned me to the beautiful pre-Swole Ear days. A time where I could happily go weeks between hearing new records, and just enjoy music because I liked it—no word-count-intensive-explanation required. Oh well, I’ll stop bitching. I’ll be done with this soon enough. Two Door Cinema Club’s terrible band name is inversely proportional to the quality of their music. I love Tourist History, I really do. It’s all pretty standard rock music, but that’s all it has to be. TDCC don’t need to reinvent the genre as they have thoroughly mastered it. This record is made up of ten short, catchy rock songs, and shines because of its simplicity. I didn’t realize that they were playing at Lollapalooza until now. I’m really looking forward to their set, as they’re definitely a perfect band for festivals. Every song that they make is catchy and danceable, so they’ll have no problem pleasing a crowd that is unfamiliar with their material. Those are always the best festival shows, anyway. TDCC wont have the common boring-set problem, as all their stuff sounds like you’ve known it forever.